"There is no e-democracy in Estonia!" has said Robert Krimmer, the Professor of e-Governance at the Tallinn University of Technology. Can that provocative quote hold true in the digitally witty and globally known e-Estonia? Unfortunately it can, as has shown the two years of maintaining the citizen initiatives platform rahvaalgatus.ee, along with the citizen education work around it. The thing is that the e-state is so far only service-based – e-elections, e-government, e-health and so on –, but e-democracy as described through everyday relationships between citizens and public servants, using crowd wisdom in policy-making, engaging more people in solving societal issues, protecting the rights of the underprivileged, contributing to openness and transparency of state and local governance is much more than a public service. There are also voices saying that the outdated model of public service hinders the further success of e-Estonia. Nevertheless, the yet unrealised potential of e-democracy can be taken as an opportunity for deepening collaboration between the government sector, openness advocates and social innovators working towards the common goal of renewing governance and democracy. If we watch back how e-voting was introduced in Estonian society, we can proudly confirm that the amount of e-votes collected on rahvaalgatus.ee throughout the first 20 months are bigger than e-votes collected during the first e-elections of Estonia (by the way, we are still the only country in the world to enable e-elections). This indicates that rahvaalgatus.ee follows similar patterns of technology adoption. During the two years of operations, 16 initiatives have reached the parliament through the platform (in total 31 since 2014), more than 30 proposals still gathering signatures. While many discussions are in progress, one collectively proposed problem has been solved with the help of the Parliament: protecting the habitat of the flying squirrel. Some of the other raised issues have been solved by ministries or are still under discussion. 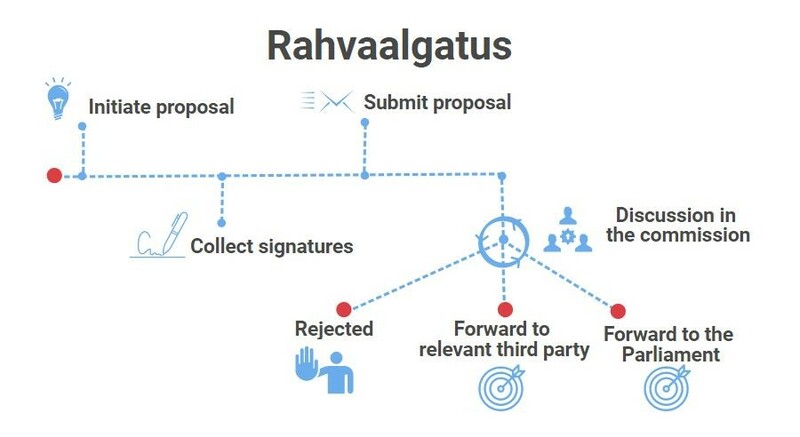 At rahvaalgatus.ee we do not count the success rate by draft acts initiated or changed but by assessing whether the problem raised was solved or whether the submitted proposal got adequate feedback.